Boy, has this week flown by! Here we are at the weekend already and I feel like the week’s only just begun. Part of this has been the progression of a new project. TheMothMan and I are starting work on a new field guide to the common moths of northeastern North America, which we’re pretty excited about. I haven’t wanted to say anything till I felt it was sure to go ahead, but we just secured an agent to represent the book so it looks like it should be more a question of where, rather than if, it gets published. Our agent also represents such notable naturalists and authors as Julie Zickefoose, David Sibley, Pete Dunne, Lang Elliott…. excuse me while I geek out for a moment. How often does something happen to bring you two degrees of separation from your idols? It’s only slightly less thrilling than if I’d met them in person. Okay, composing myself… back to the topic at hand. Moths as well, as it turns out. Or rather, their larvae. The above photo I took a few weeks ago, at the beginning of April. It completely encircled a small branch of a small tree, with white egg surfaces on top, but a crusty golden layer across the bottom. It wasn’t very big, perhaps a couple centimeters at most in its longest direction. I filed it away as “unknown insect egg mass” and there it stayed for a couple weeks. Then, while looking up something completely unrelated (always the way, isn’t it?) 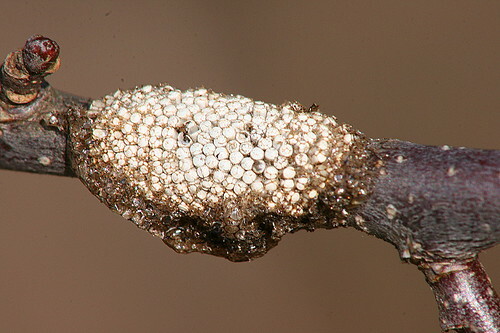 I stumbled across a photo in the ID Request section on BugGuide.net that looked just like my egg mass. They were Eastern Tent Caterpillar eggs. They were especially conspicuous against the dark bark of the tree they were on, or I may not have noticed them at all. This week, when I arrived at my parents’ for a couple days, I was struck by the huge number of web tents in the trees. I wondered if there really were an unusual number this year, or if it was just that I was taking more notice this year, what with the motivation of potential blog entries making me more attuned to these sorts of things. Either way, there seemed to be lots of them, two or more in a few trees even. My mom pulled out her handy dandy Stokes Guide to Observing Insect Lives and we looked it up (my images are nicer… :) ). Over the winter we’d investigated Chokecherry Tentmakers. Thinking that I’d seen several webs in the chokecherry out front, I’d suggested it was these. In fact, they don’t appear till later in the summer. 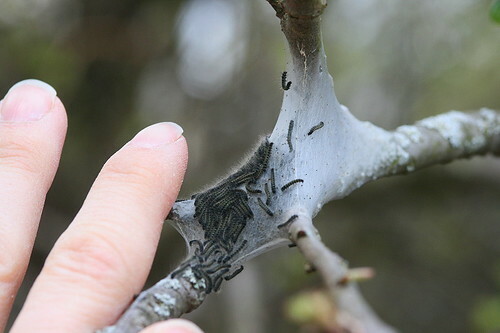 The only web tents found at this time of year are those of the Eastern Tent Caterpillar (Malacosoma americanum). 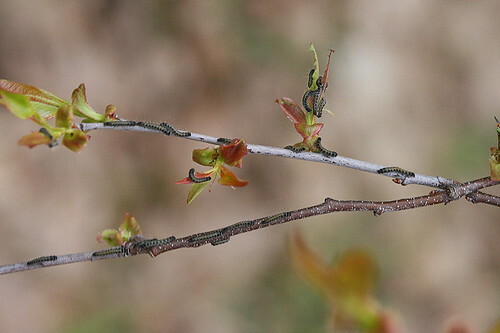 There are two primary species of tent caterpillar: the Eastern and the Forest. The Forest is associated mostly with oaks and maples. The Eastern is found on trees of the Rosaceae family, most notably apple (cultivated, wild, and crabapple) and cherries (cultivated, Black and Chokecherry), as well as hawthorn, pear and plum. Indeed, when I really stopped to look, all the tents at my parents’ appeared to be in the chokecherries, the crabapple, and the cultivated apple trees. And the little tree where I’d found the eggs at the station was also a young apple. When I checked back this week, sure enough, there was a little tent. The most obvious sign of their presence, of course, is their web tents. When the caterpillars hatch out of their egg cases they migrate along the branch till they reach a major fork, where they set up shop. 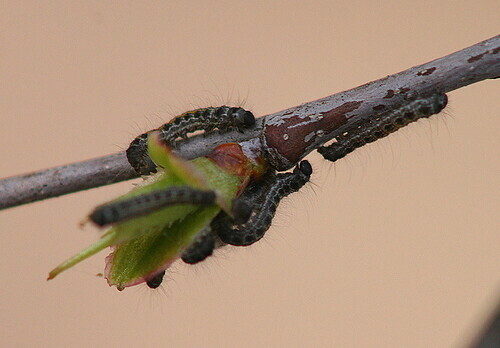 This is another feature that tells the tent caterpillar apart from the webworms; tent caterpillar nests are never out at the end of the branches. The young caterpillars all band together in an amazing show of cooperation, building the first little nest to get them started. As time progresses and the caterpillars eat and grow, they build more layers on the nest to expand it. They lay down silk on the outside of the nest, and as it dries it tightens, eventually separating from the layer it was laid down upon. This creates a stratified effect within the nest. As the caterpillars grow they need more room, but they also require additional layers as the existing ones become filled with frass and moulted skins. 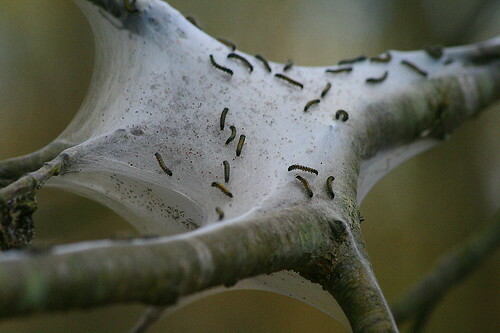 The caterpillars leave a hole or two in the webbing, usually near the apex but potentially anywhere, by which they come and go from the nest. You can see the hole here. They tend to lay down the most silk on the side that faces the sun most directly. Usually this is the southern or southeastern side, which allows them to catch the morning rays more efficiently to warm up at the start of the day. You can see in this picture, of a relatively new nest beside my rather dry fingertips, just how small the caterpillars are to start off. They use the nest for a number of purposes. The first and perhaps most obvious is for protection from both predators and the elements. When not feeding, the caterpillars huddle inside the tent. They also use the outside of the tent for basking or huddling to raise their body temperatures prior to heading off to feed, which you can see them doing in this photo. They pack together like this to reduce individual heat loss due to air movement. 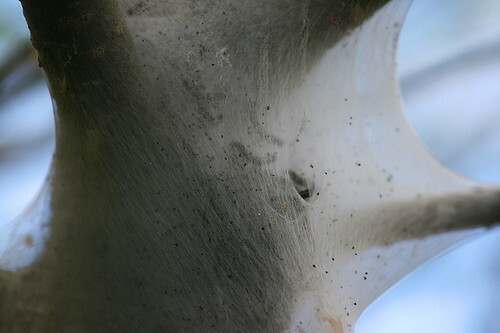 The stratified layers within the nest also help them thermoregulate, as the silk traps heat like a mini greenhouse. By moving in or out as needed they can adjust their temperature. As the caterpillars move about, they are constantly laying down silk secreted from a spinneret at their tail-end. In going to and from the feeding areas they end up creating silken trails along the branches. They appear to follow these trails when moving, but they’re actually following a trail of pheromones that are also laid down by individuals. Initially, or once a particular source is depleted, individual caterpillars will go on “scouting” trips, looking for good food sources. So that they can find their way back to the nest they leave a scent trail to trace their steps. If they found a really good source of food, on their way back they lay down a stronger, more specific pheromone trail that tells the nestmates where the good stuff is. Well-traveled trails will be strongly defined with silk, while new or lightly-traveled trails may be barely visible. Here you can see the empty egg cases of the little caterpillars, with a silken trail leading away towards the nest. 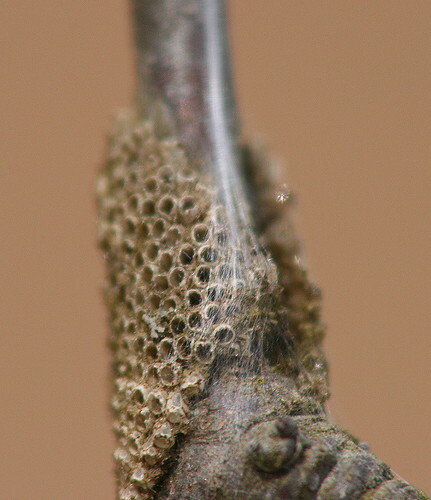 The eggs are laid by the adult moths in the late spring or early summer, about 200-300 in a single egg mass. It doesn’t take long for the caterpillars to develop within the eggs, only about three weeks. However, they then remain dormant until the following spring. They hatch out just as the leaves are beginning to unfurl. Occasionally, the caterpillars from two or more egg masses laid close by to each other will come together to form a single colony. I think that’s what happened in the case of this bunch, since I found at least three empty egg masses within the same branching system, but only one nest. The caterpillars will eat and grow and shed their skins and eat and grow some more for 4-6 weeks. They’ll go through six larval stages, or “instars”, each one still a caterpillar, but getting progressively larger. In their sixth instar they stop laying silk down on the nest or trails, instead conserving it for pupating. It’s during this stage that you usually find the caterpillars on sidewalks, benches, roads, and elsewhere, as they disperse from the nest to find a safe location to spin their cocoon and pupate. The cocoon is usually tucked into a corner or crevice, and is fuzzy and imbued with a yellow powder. 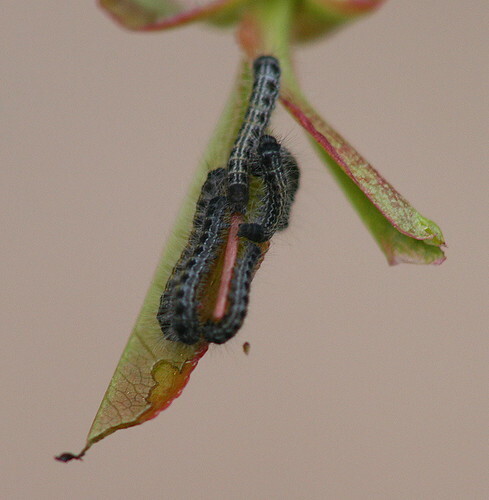 The caterpillars come out of their nests three times a day to feed, all corresponding with the times of lowest predator (especially bird) activity: at the crack of dawn, in early afternoon, and at dusk. The only deviation to this pattern is in their final stage, when they only emerge at dusk. They back this up with a chemical deterrent. Apple and cherry tree leaves, in particular, contain small amounts of cyanides, which the caterpillars ingest. When disturbed they produce cyanide-laden fluids to dissuade predators. Tent caterpillars are much-maligned because they’re a defoliator. 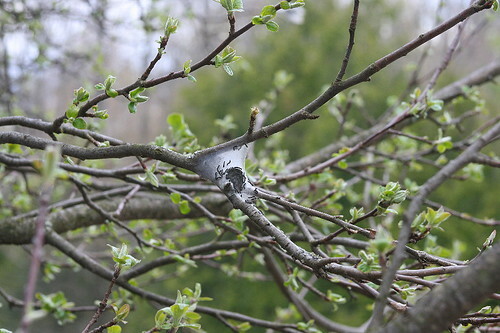 I recall as a kid being under the impression that tent caterpillar nests, when found, should be cut from the tree and burned to prevent spread of the infestation. What a dramatic reaction! An individual nest will not do significant harm, and in fact even an outbreak of the insects will not do any lasting damage to a tree. 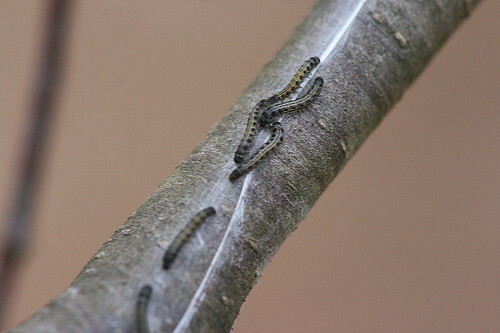 The caterpillars rarely kill their host trees, usually only if the tree was already weak or damaged prior to infestation. 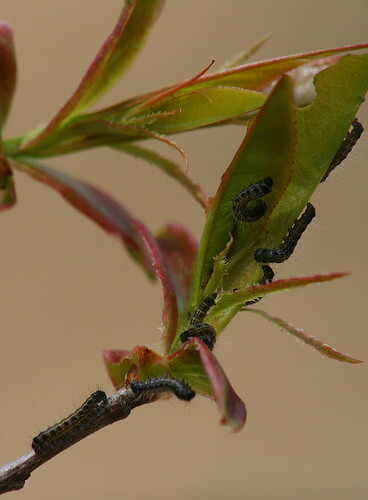 Any defoliation caused by the insects will generally regenerate later in the summer, once the caterpillars have headed off to pupate. Of course, depending on the size of the colony, it may be possible that that year the tree doesn’t produce any fruit. I think this may be where their bad rap stems from – they would be nuisance pests in orchards where they may stunt the fruit crop for the year. They are likely also perceived as unsightly in suburban settings (both their nests and the resulting defoliation). But really, they’re pretty harmless. The only potential problem the caterpillars may cause is they’ve been implicated in Mare Reproductive Loss Syndrome (basically abortion by horses). The going theory is that the hairs of accidentally ingested caterpillars may puncture the intestinal walls and provide a conduit that allows bacteria to enter the uterus. I like to cheer for the underdog (unless there are obvious good/evil sides), and so I support the tent caterpillars, much as I back Purple Loosestrife and Brown-headed Cowbirds (subjects of future posts, I’m sure). They’re a good food source for many creatures, including as many as 60 species of birds, maturing just when the birds are looking for bugs to take home to feed the kids. another really interesting post and I’m not at all surprised that an agent to the “stars” would want to represent you. From the first post that I read by you I have thought you were someone who should write a guide book or a text book. Your explanations are very understandable to lay people. You make it real and involving. I’ll be one of the first in line to buy the field guide. Your pictures are much better than those in most guide books. Like Beth I find your posts interesting to read. I have always thought tent caterpillars were disgusting and hate the thought of them falling on my head. There are so many around The Pinery. However, you do make an strong case in their favour and they are part of the food chain. What Beth said. And Ruth. Congratulations! I’ve always thought tent caterpillars were beautiful, all fuzzy and blue. Now that I know they’re not the monster we were taught they were, I won’t feel so guilty about moving them off sidewalks to prevent their getting flattened. Thanks! Thanks, guys. I really appreciate your kind words! I’m looking forward to this project, and I’m hoping that it will actually lead to additional books in the future as well. I think a lot of creatures are demonized unfairly. I hope to make a case for a few of them here! Even if people retain their original opinions, if I’ve at least given them pause to think about it that’s my goal. Ooo, now that is tempting. I don’t do a lot of traveling usually, but as you point out, it’s not that far. I’ll have to talk to Blackburnian and see what we’re up to that weekend. She too is willing to see both sides of the story; I think you’ll enjoy this post. And I look forward to reading YOUR post in full soon. I always benefit from reading your blog. Thanks again! Are these the same as Gypsy Moths? We used to see huge tents in the trees out in New York when I was little.